Bill Pfleging and Minda Zetlin have a mixed marriage. Bill is a geek, having worked at IBM and tinkered with computers and technology all his life. More recently, he was director of Internet Community for the Lycos Network and other dot-coms, and is now a computer consultant, and technology columnist for the Woodstock Times in Woodstock, New York. Minda is a suit, with more than 20 years' experience writing about business, management, and workplace issues. Her most recent book is Telecommuting for Dummies. 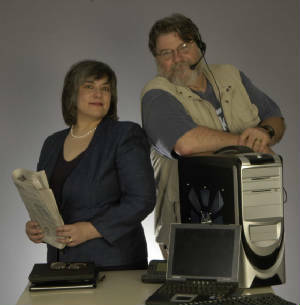 Bill and Minda first noticed the Geek Gap when they found themselves in heated discussions about the things going on in his workplace, or in her writing. He would be outraged that the new technologies he was helping to build were being valued only for their immediate ability to bring in hard cash. She wondered why he expected his company to focus on anything other than turning a profit. Eventually, it dawned on them both that the business/technology problems they were seeing in the companies where he worked or that she wrote about all had the same root cause: the culture clash between business people and technology people. 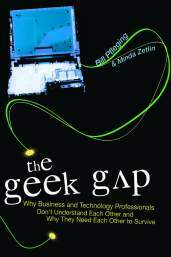 In other words, what they came to call the Geek Gap.